LOCATION.--Lat 43°15'29.7", long 75°36'46.9" referenced to North American Datum of 1983, Oneida County, NY, Hydrologic Unit 04140202, on downstream right abutment of bridge on Oswego Road, 0.6 mi northwest of Becks Grove, and 2 mi downstream from confluence of East and West Branches of Fish Creek. GAGE.--Water-stage recorder. Datum of gage is 368.97 ft above NAVD of 1988. REMARKS.--Water Years 2015-17: Records good except those for estimated daily discharges, which are fair. Water Year 2018: Records good except those for estimated daily discharges, which are poor. 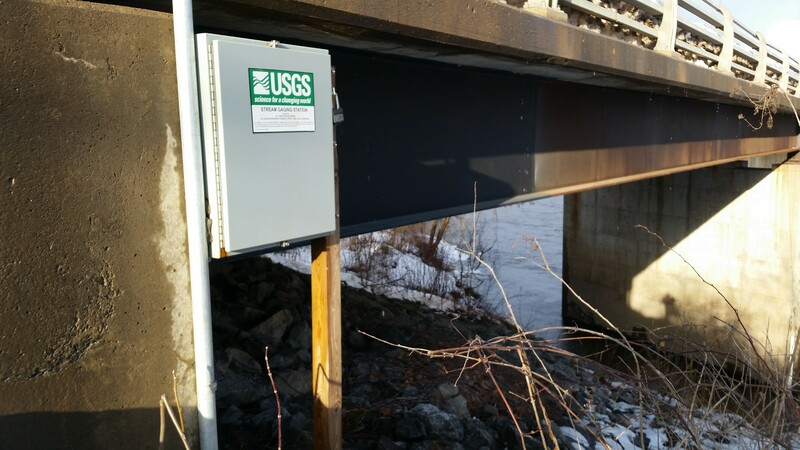 EXTREMES FOR PERIOD OF RECORD.--Maximum discharge, 13,800 ft³/s, Jan. 13, 2018, gage height, 20.59 ft; minimum discharge, 110 ft³/s, Aug. 9, 10, 2016, gage height, 3.94 ft.